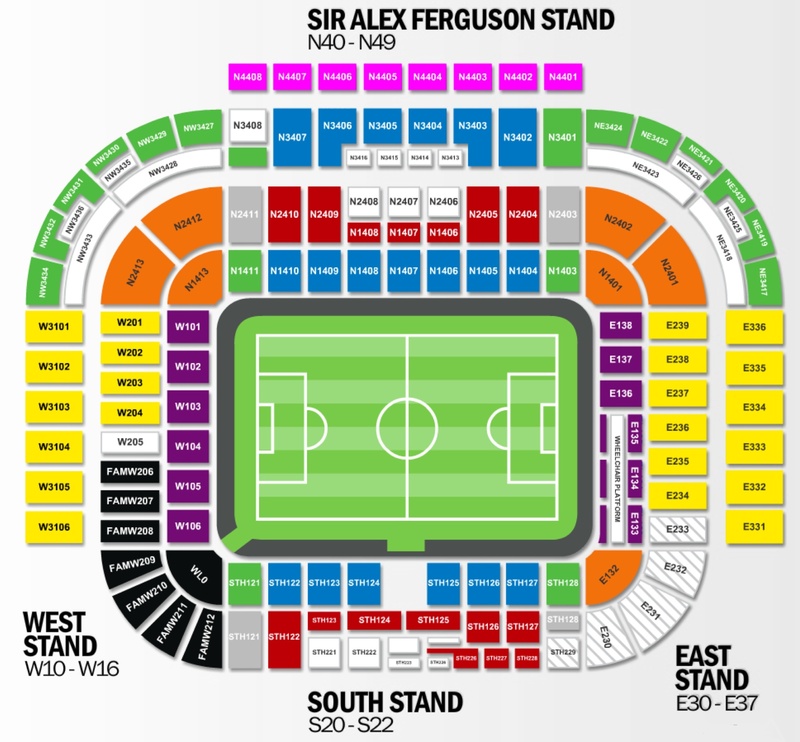 With space for 76,212 spectators, Old Trafford has the second largest capacity of any English football stadium after Wembley, the third largest of any stadium in the United Kingdom, and the eleventh largest in Europe. It is one of two stadia in the country to have been given a five-star rating by UEFA. It offers unrestricted views from all areas and, although high up, the view from the top of the third tier is something quite special. It's a traditional football stadium and on European nights especially, the atmosphere is unrivalled. Visiting supporters are accommodated in the Lower South Stand and South East corners of the ground which offer exceptional unobstructed views of the pitch accommodating up to 3,000 fans. Facilities in terms of toilets are very good but refreshments can be expensive and queues at half time are very long. Leg room between rows is at a premium but no overly uncomfortable. Pubs in the immediate vicinity include the Trafford, at the junction of Sir Matt Busby Way and Chester Road, which, primarily due to its location has a tendency to get very busy as kick off approaches. It doesn't offer anything out of the ordinary, but there are several small screen televisions showing the early kick off's. Bishop's Blaize is a typical Wetherspoons establishment on Chester Road, round the corner from Sir Matt Busby Way, which offers the usual food and drink fare. Again, it's pretty standard stuff. Lou Macari's fish and chip shop at the top of Sir Matt Busby Way is always incredibly popular before kick off and is handily situated 2 minutes from the ground and next door to a bookies to get that pre match bet on! Parking can be expensive around the stadium. Advice from fans would be to use Salford Quays Lowry Mall, a ten minute walk away from the stadium, the cost of which is £3. Street parking is very limited and you'd need to arrive very early to be in with any chance of finding a space within a 15 minute walk. There are many 'football' car parks ranging from £6 to £10 per car. Manchester is well-served by trains from all over the United Kingdom. There are three mainline stations – Victoria, Oxford Road and Piccadilly which form a triangle in the main city centre, Most trains stop at the larger Manchester Piccadilly, though some Liverpool – Leeds/Bradford/Huddersfield use Manchester Victoria instead. The nearest / closest train station to Manchester United's Old Trafford is within the stadium itself and the railway station is often referred to as Manchester United FC Halt or Old Trafford Halt on the Liverpool Lime Street – Manchester Piccadilly line, open on match days only. Entrance to the ground is via a narrow set of turnstiles off the platform. Travel: Drove on all visits, parked in a little car park off Broadway every time with no problem. It's a fair walk to the ground, but the time spent walking you’d only spend sat in traffic on Trafford Road anyway! Refreshments: Pubs are an absolute no go, home fans only everywhere near the ground and you just won’t get in. If you head to the top of Matt Busby Way, there are loads of chippies, off licenses etc. so you can still get a drink. Impressions: You just can't walk up those steps into the Old Trafford away end, and not have it take your breath away. Its size is still amazing every time I go. Shame it doesn’t extend to the seats, horrible lack of legroom and very cramped all over the away end. Enjoy: It's a pretty unwelcoming place for anybody in possession of a scouse accent, but the ground itself can't help but impress. Travel: Mainly by car (I live in Essex - but am an ex-Salfordian !) Travelling from the M.6 - take signs for the A.57 - then down to Altrincham - Stretford - along the Chester Road. Impressions: Breathtaking - excellent views from all the seating areas. Being somewhat short in height I like to get a seat in one of the upper tiers - ideally looking across to the far corner. Atmosphere very good although PA system cranks the noise up just before the teams come out. Facilities: Staircase areas very clean - lots of staff on duty - police too. Toilets very modern and clean. Leg room not a problem for me (pity about that) but seat comfortable. Exit: Can be tricky - especially by car. There is a VERY good 'official' car park just a couple of hundred yards from Old Trafford - you will approach along the Chester Rd - car park (signposted) on the left. Best to try to leave at least five minutes before the end - again a pity - but side streets leading to the main road - then to the Motorway - can be very crowded - head for M6 and signs for Birmingham. Enjoy: ALWAYS enjoy the visit - if you are able to arrive fairly early before kick-off & have some time to spare - Salford Quays worth a visit - shops and plenty of places to eat. Huge (official) car parks by the ground but getting away can be tricky. 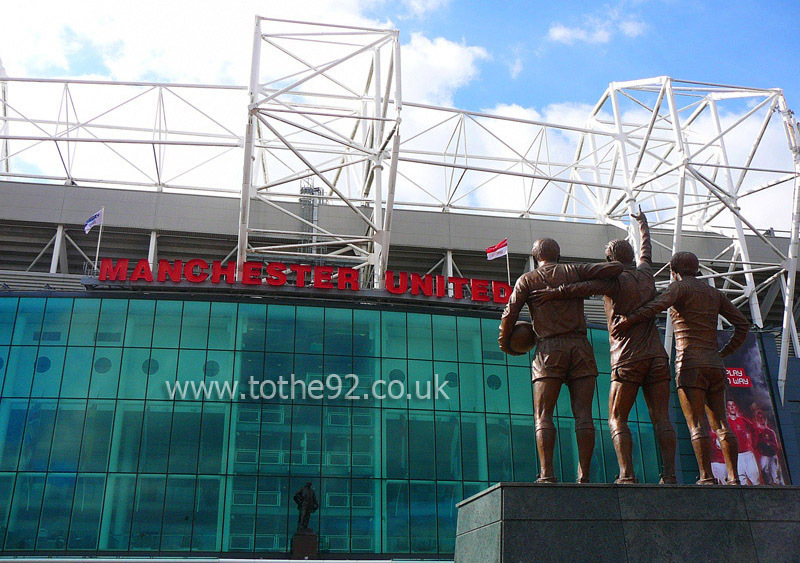 Have you been to Manchester United's Old Trafford? To tell us about your experiences and to feature on the site, simply complete the fans review form below!